Join us for a conversation with best-selling author Brandon Carson, who will help you imagine the possibilities for transforming how learning happens in your organization. 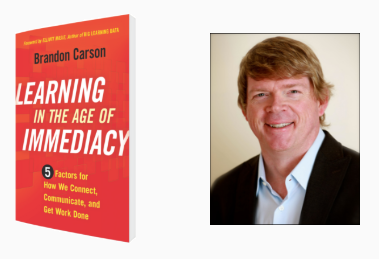 Brandon is the Director of Learning at Delta Airlines and author of Learning in the Age of Immediacy: 5 Factors for How We Connect, Communicate, and Get Work Done. His latest book explores how the digital transformation is affecting workplace performance. Advancing technology, digital culture, and increased speed of business have changed our world and require learning to keep pace. Welcome to the Age of Immediacy, where learners expect information to be available anytime and anywhere. Brandon Carson is an award-winning, strategic, and highly accomplished learning and development executive. He has extensive expertise in developing learning strategies and learning technology implementation for Oracle, eBay, Apple, Yahoo, Microsoft, Intel, and other global companies. He currently leads a team dedicated to designing and delivering next-gen learning methods for Delta employees. Brandon has helped build several L&D organizations, modernizing their approach with new design and delivery technologies and methodologies while increasing their business impact and reducing total L&D expenses. He has led major program initiatives, including mobile, social, game-based, and other technology-based learning programs for global workforces and for L&D restructuring and optimization. Additionally, Brandon is a keynote speaker and best-selling author, and he has a B.A. in Business Communication and an M.Ed in eLearning. Contact us for more information or if you are interested in attending! Note: Attendees must hold a leadership position in a public or private learning organization. 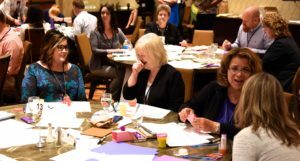 Founded and sponsored by Fredrickson Learning, the Summit is the annual premier gathering of leadership-level learning professionals in the Twin Cities. Join more than 100 peers for our twelfth annual Summit! Click the image to see 14 pictures from last year’s Summit. I saw Jay’s post about this on LinkedIn. Please provide information and/or cost.